One thing that most people know about us is that we love superheroes, comic books, and other nerdy/geeky things. 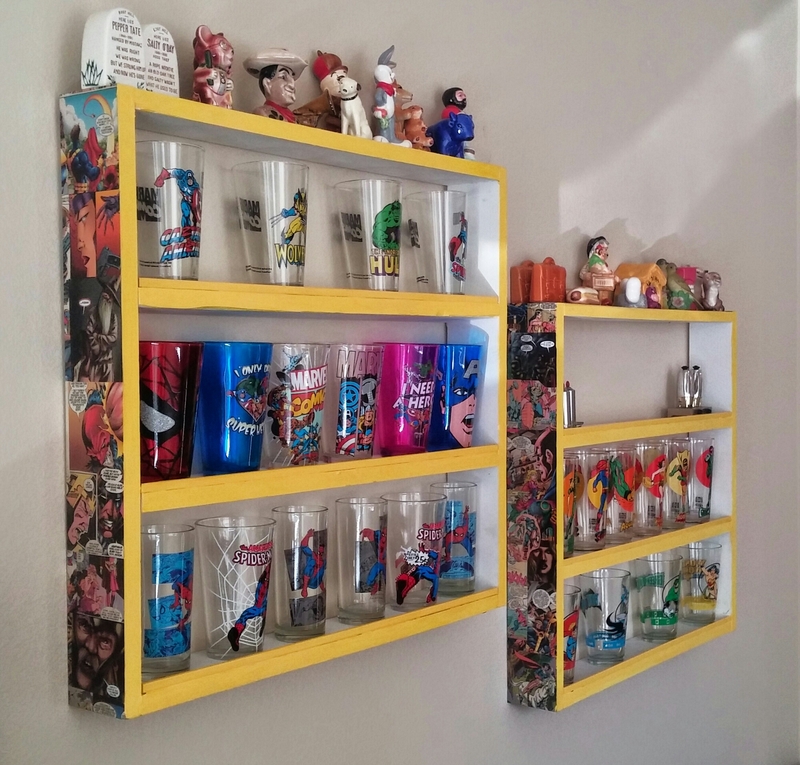 We got our first set of superhero cups as part of our wedding registry. 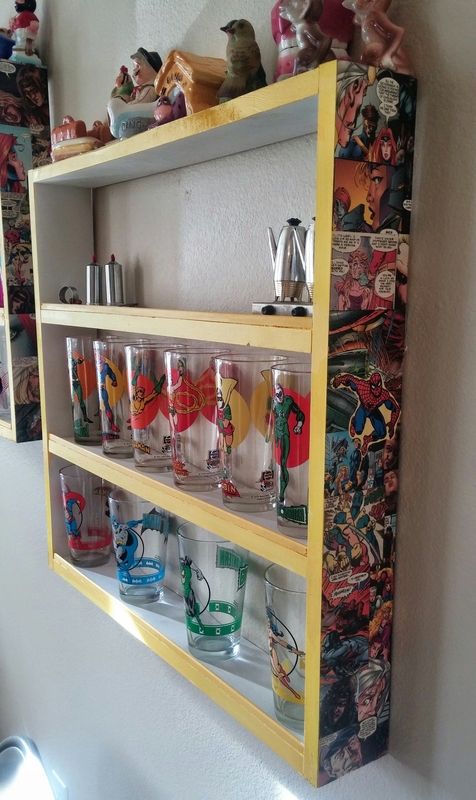 Although I already had some vintage DC cups long before we were married. We have continued to accumulate more since then, and have more than 20 now. 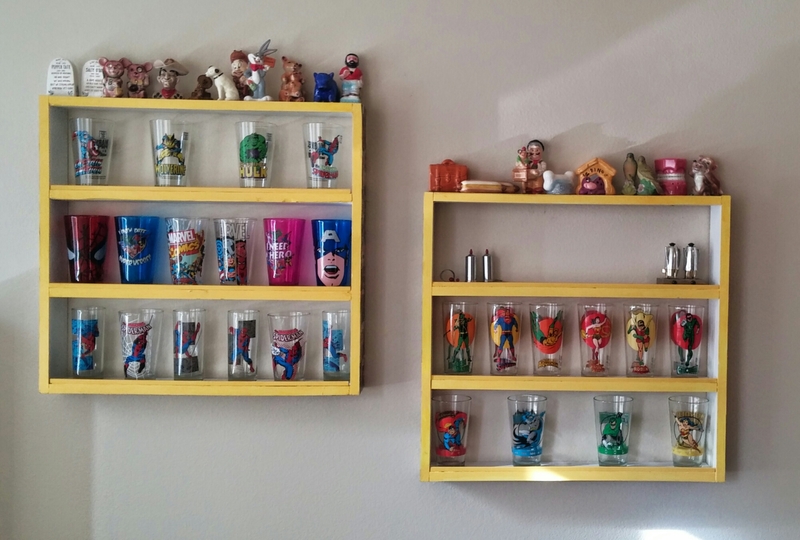 I knew that I wanted to display them , but was unwilling to spend a lot on shelving that I didn’t particularly love. So, we built our own. We followed this basic tutorial (even though it’s for a doll house). After it was built, we painted the inside white, covered the sides with comic books pictures and Mod Podge, and painted the front edges yellow. I love the way it turned out. The only real problem is the yellow clashes slightly with our tan walls, but I plan on having a white kitchen one day, so then it won’t matter. We will need to get some more DC cups so it doesn’t look so lopsided, but for now, we are enjoying what we have. For the last several months, I have picked up cross stitch and I have really enjoyed it. I have a project from Christmas that I will be sharing soon (it will get sent out this week). These are two projects that I finished in the last couple of weeks. 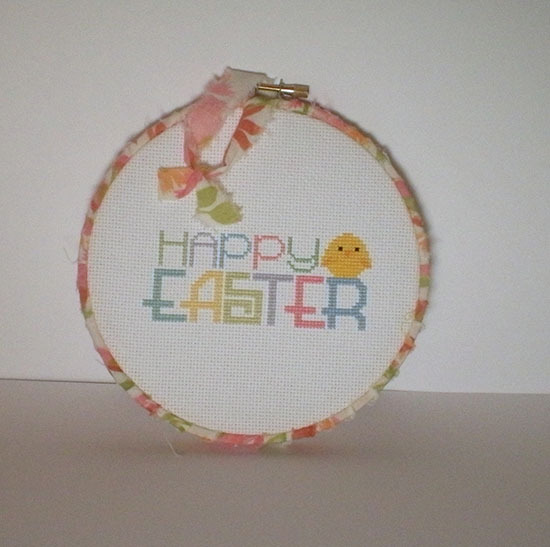 The Easter pattern is from Sewing Seed and was free for newsletter followers. This was a simple pattern, and I was able to finish it up in about a week. I used a vintage floral pillowcase and tore some strips to wrap around the hoop and to use as a tie. This is now hanging in our house ready for Easter next week. 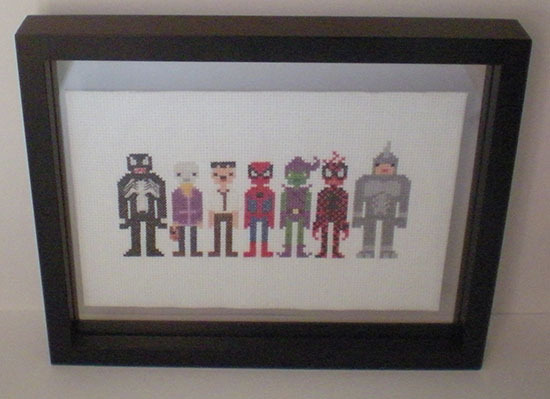 This pattern is the Spiderman and Friends from Wee Little Stitches. I framed the cloth in a floating frame, which creates an interesting dimension to the piece. I am currently working on a corresponding pattern with the Sinister Six, so look for that in the next month or so. I have a number of other projects that I am excited to get started on, including some more superheroes, Harry Potter, and maybe some princesses even. Thanks for reading! I have not done any posts about our apartment yet, mostly because I don’t totally love our decor and there are lots of little things I would love to change. However, there are some things I absolutely love, and I decided to share them. One of the things that I love is left over from our wedding reception (like most of our decorations). 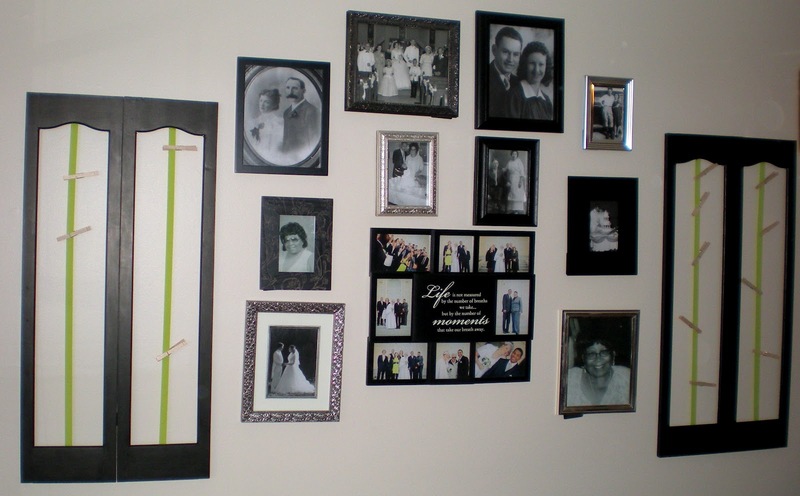 Its a wall of photographs of our family. There are pictures, mostly of my ancestors, around the time that they got married. There are two pictures of Aaron’s mom, two of my parents, my maternal and paternal grandparents, two sets of great-grandparents, and three sets of great-great-grandparents. The center frame is a wedding present and includes pictures from our wedding of family at the temple. And the two window frames on the side are actually old cupboard doors. The image on the left is the original color, which would have been fine without the ugly gold. 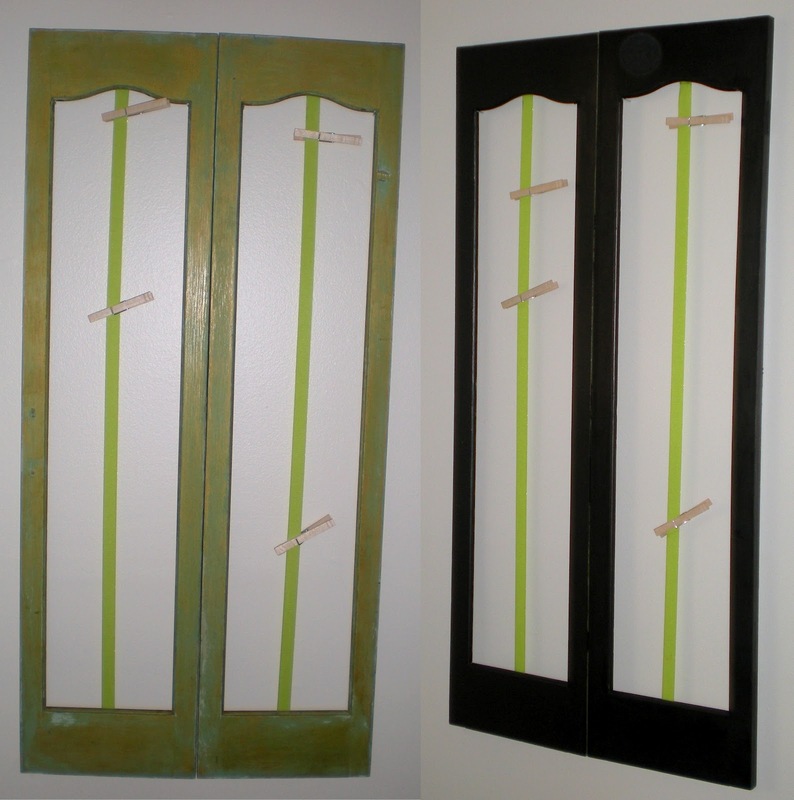 So I painted them black and added some green grosgrain ribbon left over from our wedding. I use them for wedding invitations or cards, which adds extra color and variety. I just finished the wall because I needed to replace two of the frames (the others would not hang on the wall), and I finally got some wedding pictures to put in the collage frame. I absolutely love having family photos around our dinner table and in the center of our home to be a constant reminder of the importance of family and the ancestry that we have. This will be something that I want to always include in any of our homes to have the physical reminder. Enjoy!